Home » All our PET SUPPLIES » Treats & Snacks » Dog Treats » Chicken Breast Tenders for Dogs from PCI 3 sizes ON SALE!! Home » Dog Supplies » Dog Treats » Chicken Breast Tenders for Dogs from PCI 3 sizes ON SALE!! Home » All our PET SUPPLIES » Dog Supplies » Dog Treats » Chicken Breast Tenders for Dogs from PCI 3 sizes ON SALE!! Quackers are a great alternative for your best friend if allergic to chicken or beef or simply just enjoys duck meat. Veterinarians love to sell our Quakers! 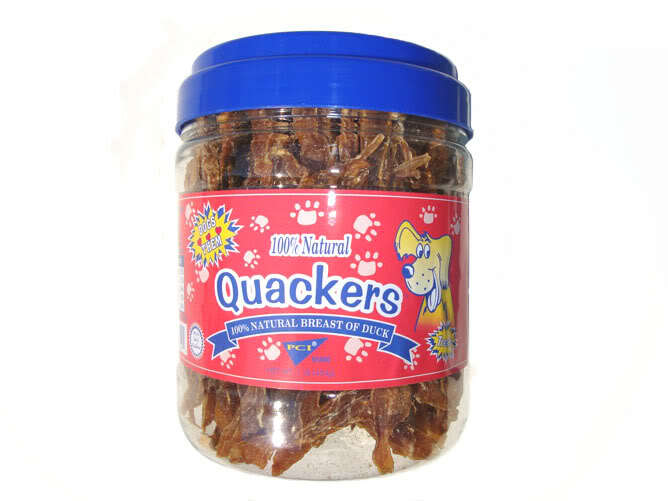 QUACKERS� are made from 100% natural breast of DUCK. That�s right! They�re actually slices of DUCK breast that are slow roasted in their own juices...locking in the flavor. DUCK has a strong and very distinct flavor that dogs go crazy over! They are sure to be habit forming! QUACKERS� are currently available in 3 and 8 ounce packages and 1LB canisters.